The area which would include what would become Scottsdale was originally inhabited by the Hohokam, from approximately 300 BC to 1450 AD. This ancient civilization farmed the area and developed a complex network of canals for irrigation which was unsurpassed in pre-Columbian North America. At its peak, the canals stretched over 250 miles, many of which built remains extant today, some having been renovated and put back into use in the 20th century. Under still-mysterious circumstances, the Hohokam disappeared around 1450 or 1500, the most likely theory having to do with a prolonged drought. The area's later occupants, the Pima and O'odham (also known as the Papago), are thought to be the direct descendants of the Hohokam people. Before European settlement, Scottsdale was a Pima village known as Vaṣai S-vaṣonĭ, meaning "rotting hay." Some Pima remained in their original homes well into the 20th century. For example, until the late 1960s, there was a still-occupied traditional dwelling on the southeast corner of Indian Bend Road and Hayden Road. Currently, those Pima who live within Scottsdale reside in newer homes rather than traditional dwellings. Many Pima and Maricopa people continue to reside on the Salt River Pima-Maricopa Indian Community, which borders Scottsdale directly to the south and east. In the early to mid 1880s, U.S. Army Chaplain Winfield Scott visited the Salt River Valley and was impressed with the region and its potential for agriculture. 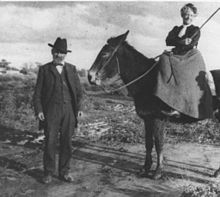 Returning in 1888 with his wife, Helen, he purchased 640 acres for $3.50 ($92 as of 2015)  an acre for a stretch of land where downtown Scottsdale is now located. Winfield and his brother, George Washington Scott, became the first residents of the town, which was then known as Orangedale due to the large citrus groves planted by the Scott brothers. Many of the community's original settlers, recruited by Scott from the East and Midwest, were educated and had an appreciation for cultural activities. The town's name was changed to Scottsdale in 1894, after its founder. In 1896, these settlers established the Scottsdale Public School system, and opened the first schoolhouse, which was followed by the opening of the first general store by J. L. Davis, which also housed the first post office for Scottsdale in 1897. 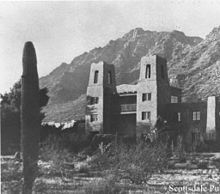 In the early 1900s the community supported an artists and writers culture, culminating in the opening of the region's first resort in 1909, the Ingleside Inn, located just south of the Arizona Canal and west of the Crosscut Canal (Indian School Road at about 64th Street) in what is today Scottsdale. Also in 1909, Cavalliere's Blacksmith Shop opened in downtown Scottsdale, and the original schoolhouse was replaced by the much more expansive Little Red Schoolhouse, which remains standing to this day. While not in its original building, Cavalliere's has been in continuance operation since that time. In 1912, both the Phoenix Street Railway Company and a competitor, the Salt River Valley Electric Railway Company, proposed building streetcar lines to Scottsdale but due to an economic downturn, neither was built. Between 1908 and 1933, due to the construction of the Granite Reef and Roosevelt dams (in 1908 and 1911, respectively), Scottsdale's population experienced a boom, growing steadily during those years. Scottsdale became a small market town providing services for families involved in the agricultural industry. During the First World War Scottsdale and its environs supported a large cotton farming industry, which was due to the creation of Long Staple Egyptian Cotton, developed by the US Department of Agriculture. Although cotton is still grown in southern Arizona, Scottsdale's cotton boom ended with the loss of government contracts at the end of the war. In 1920, a second resort was opened on 12 acres of the property owned by the artist Jessie Benton Evans. Called the Jokake Inn, meaning "mud house," the structure still stands on the grounds of the world-famous Phoenician Resort. 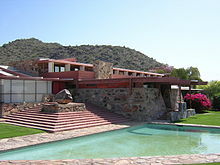 The Depression years saw an influx of artists and architects to Scottsdale, which included, in 1937, the internationally renowned Frank Lloyd Wright. In 1937, Wright and his wife purchased 600 desert acres at the foot of the McDowell Mountains and established what is now known as Taliesin West, his winter home and his architectural firm's Southwestern headquarters. Scottsdale and the rest of Phoenix have seen an everlasting influence from Frank Lloyd Wright. Many buildings throughout the region were designed by the famous architect. His significant influence on the regional architecture is commemorated through a major street which bears his name and a 125-foot (38 m) spire memorial designed by Wright himself in North Scottsdale. Among the more significant events during the years of World War II was the opening of Thunderbird II Airfield in 1942 (which later became Scottsdale Airport), where 5,500 pilot cadets received their primary flight training before the war's end. Scottsdale was the site of a German prisoner of war camp at the current intersection of Scottsdale and Thomas Roads in what today is Papago Park. In 1950, the town continued to grow as Motorola became the first of many technology companies to build a plant in Scottsdale. They would follow with a second plant in 1956. With a population of approximately 2,000, the city was incorporated on June 25, 1951. The city appointed its first mayor, Malcolm White, and adopted the motto "The West's Most Western Town." The seal, depicting a mounted cowboy surrounded by a 64-pointed starburst, was designed by Mrs. Gene Brown Pennington. The town began a period of rapid population growth after its incorporation in 1951, growing from 2,000 to 10,000 residents during the 1950s. This growth necessitated development into the flood plain known as the Indian Bend Wash. Flood plains throughout history have been enticing locations for development due to their flatness, ease of building and inexpensiveness. This is even more temptation in a desert environment, when flooding so rarely happens. As Scottsdale expanded, the Indian Bend Wash virtually bisected the city in half north to south. In the late 1950s, the problem became more and more pronounced, until in 1959 the Maricopa County Flood Control District (MCFCD) was formed by the Arizona State Legislature. The MCFCD became the lead player for developing a comprehensive flood plan for the entire county. At the same time, the Army Corps of Engineers began to look into the problems of flooding in Maricopa County. Over the course of the next several years, they would present several plans, which all revolved around constructing concrete canals and levees to channel and divert the flood waters, as well as building bridges over the canal, similar to the storm drains of Los Angeles. However, during MCFCD meetings held between 1961 and 1963, a different course of action was being developed. This plan would become known as the multi-use, or Greenbelt, concept. The two concepts were at odds with one another until the canal plan was defeated in a bond referendum in 1965. In 1966 a study was commissioned which validated the Greenbelt concept as a way to prevent flood damage. After a major flood in 1972, work on the Greenbelt project began in earnest, and continued through 1984, by which point the major Greenbelt was completed, although minor projects continue through the current day. Today, the 12 mi (19 km) long Scottsdale Greenbelt connects four city parks – Vista del Camino Park, Eldorado Park, Indian School Park and Chaparral Park – through a 25 mi (40 km) bike path. Scottsdale Spire, located on the southeast corner of Bell and Scottsdale Road in Scottsdale, was an Arizona State Capital Project designed by Frank Lloyd Wright. Its construction began in 1957, but due to Wright's death, it was not until 2007 that it was adopted and finished by the Taliesin Associated Architects. The 1960s and 70s continued to see the city's growth, the population exploding to almost 68,000 by 1970. Most of the unused property within the city limits was to the north, so that was the direction in which the city expanded. The city, which in 1959 had spanned 5 square miles, had expanded its borders to now encompass 62 square miles. Large ranch tracts covered huge areas in the northern part of the city. One of the largest of these was the McCormick ranch, a 4,236 acre ranch serving much of the eastern boundary of Scottsdale and was owned by Fowler and Anne McCormick. Fowler's paternal grandfather was Cyrus McCormick, the inventor of the grain reaper, and his maternal grandfather was John D. Rockefeller. When Anne died in 1970, the property was sold to Kaiser-Aetna for $12.1 million. This started a series of large-scale, master planned communities within the borders of Scottsdale, some of which included Scottsdale Ranch (1978), Gainey Ranch (1980), McDowell Mountain Ranch (1992), Desert Mountain (1986), and DC Ranch (1990s). In 1975, the "east Shea" section, bordering Fountain Hills, was annexed by the city, expanding its area from 62.2 square miles to 88.6 square miles. This was followed by a four-year period from 1981 to 1984 during which the city annexed almost 80 additional square miles. Faced with this rapid expansion and growth, many residents became concerned about losing their southwestern scenery. The McDowell Sonoran Conservancy was born in 1991. Teaming with developers, a plan was developed to set aside the McDowell Mountains and adjoining areas in a huge preserve. In 1995, the citizens of Scottsdale voted to implement a sales tax to purchase acreage for this purpose. When completed, the 36,000 acres planned for the McDowell Sonoran Preserve will be nearly one-third of Scottsdale's land area, equal in size to Bryce Canyon National Park. From its official incorporation in 1951 with a population of 2,000, the city of Scottsdale has grown to a 2010 Census count of 217,385. It is now the state's sixth-largest city. Scottsdale is commonly defined by its high quality of life, and in 1993 was one of several cities to receive a "Most Livable City" award from the United States Conference of Mayors. The city is located in the Salt River Valley, or the "Valley of the Sun," in the northern reaches of the Sonoran Desert. Scottsdale, 31 miles long and 11.4 miles wide at its widest point, shares boundaries with many other municipalities and entities. On the west, Scottsdale is bordered by Phoenix, Paradise Valley, and unincorporated Maricopa County land. Carefree is located along the eastern boundary, as well as sharing Scottsdale's northern boundary with the Tonto National Forest. To the south Scottsdale is bordered by Tempe. The southern boundary is also occupied by the Salt River Pima-Maricopa Indian Community, which extends along the eastern boundary, which also borders Fountain Hills, the and more unincorporated Maricopa County land. According to the United States Census Bureau, the city has a total area of 183.92 square miles (476.4 km2), of which 184.2 square miles (477 km2) is land and 0.2 square miles (0.52 km2) (0.12%) is water. From the 1950s through the 1970s, several large manufacturing companies in the Scottsdale and Tempe areas used the solvent trichloroethylene (TCE) in their manufacturing and operating processes. In 1981, TCE began to show up in two Scottsdale drinking wells, and in 1983, the Indian Bend Wash superfund site was listed on the Environmental Protection Agency's National Priorities List. Physical construction of environmental remediation systems was completed by 2006, with soil cleanup expected to be completed in five years and groundwater cleanup completed in 30 years. The city also developed a robot arm garbage truck, replacing crews who dumped cans into a train of open trailers pulled by a truck, with a single operator sitting in an air conditioned cab. The city is loosely divided into four areas: South Scottsdale (McKellips Road north to Thomas Road), Old Town (Downtown) Scottsdale, Central Scottsdale (also known as the "Shea Corridor," extending from Camelback Road north to Shea Boulevard), and North Scottsdale. South Scottsdale has for many years been the working class region of Scottsdale. The median resale home price is $291,500, compared to $667,450 in North Scottsdale. A portion of McDowell Road in South Scottsdale used to be known as "Motor Mile," having at one time 31 dealerships represented along the street. The strip, at one time, generated over $10 million in sale tax revenue each year and was one of the most profitable auto-miles in the United States. In recent years, many of these dealerships have left the city, including 6 in 2008 alone. South Scottsdale is the home to a new research center for Arizona State University, known as SkySong, a collaboration between the university, local business, and global companies. The development has attracted the research and development arms of a number of international corporations. Old Town Scottsdale is an area with many streets, old fashion stores, restaurants, bars, nightclubs, and art galleries. It contains the major nightlife for the area and is a major art center of metro Phoenix. Scottsdale's main cultural district is also in this area, which includes the high-end Scottsdale Fashion Square Mall, one of the twenty largest malls in the United States,. The district has currently[when?] seen a revival, with new condominiums and hotels under construction. The Shea Corridor is so named because it is in close proximity to the east-west running Shea Boulevard. The houses in this region were generally built during the 1970s. Real estate in the Shea Corridor (Central Scottsdale) has increased during the 1990s, and overall, the Phoenix-Mesa-Scottsdale real estate market saw the largest gain in house prices in the nation during the mid-2000s with a 38.4% increase in value. There are a number of communities in this central region of Scottsdale that remain among the most highly desired residential areas in the metropolitan area, including Gainey Ranch and McCormick Ranch. A large portion of Scottsdale Road in the Shea Corridor has been dubbed the Resort Corridor for the high number of resorts locating on the street. The second Ritz Carlton in the Phoenix metropolitan area will be constructed along this corridor. North Scottsdale is currently the most actively developed area of Scottsdale as it was historically the least built up. This portion of the city also claims many of the most expensive houses in Arizona, with many exceeding $5 million in value. The city's borders are rapidly expanding to the east and west in this area, containing the McDowell Mountain range. Much of the residential boom in North Scottsdale is driven by available land to build coupled with the fast growth of Scottsdale Airpark, the second largest employment center in the Phoenix metropolitan, and estimated to become the largest by 2010. The Scottsdale Airpark, home to over 55,000 employees, 2,600 businesses and 23,000,000 square feet (2,100,000 m2) of office space is expected to continue growing by over 3,000 employees per year. Many important companies are headquartered or have regional headquarters in the park, including Acronis, AXA, GE Capital, DHL, Discount Tire Company, Fidelity Investments, JDA Software, GoDaddy.com, The Vanguard Group, And Quicken Loans. Scottsdale's climate is arid. Winters are mild to warm and summers are extremely hot. The lowest temperature ever recorded in the city is 16.0 °F (−8.9 °C), on January 7, 1913, and the highest temperature ever recorded was 122 °F (50 °C), on June 26, 1990. As of the census of 2010, there were 217,385 people, there are 69,967 owner-occupied housing, 32,306 renter occupied, and 101,273 households residing in the city. The population density was 1,181.4 inhabitants per square mile (455.6/km²). There were 124,001 housing units at an average density of 673.9 per square mile (259.9/km²). The racial makeup of the city was 89.3% White, 1.7% Black or African American, 0.8% Native American, 3.3% Asian, 0.1% Pacific Islander, 2.5% from other races, and 2.3% from two or more races. 8.8% of the population were Hispanic or Latino of any race. There were 101,290 households out of which 20.0% had children under the age of 18 living with them. According to the 2010 census 51.7% of Scottsdale's population were females, while 48.3% were males. In the city the population was spread out with 17.7% under the age of 18, 5.0% from 20 to 24, 32.6% from 25 to 49, 22.8% from 50 to 64, and 19.9% who were 65 years of age or older. The median age was 42 years. According to a 2007 estimate, the median income for a household in the city was $70,533, and the median income for a family was $92,289. The per capita income for the city was $49,158. About 3.4% of families and 5.8% of the population were below the poverty line, including 5.4% of those under age 18 and 5.9% of those age 65 or over. Scottsdale is home to a large number of churches, chapels, temples, synagogues, mosques and other places of religious worship. Though the majority of Scottsdale residents consider themselves of, or practicing of, the Christian faith(s) – including Protestant and Roman Catholic – the city's high population growth over the years has resulted in a more diverse population. Most notably, greater numbers of Eastern Orthodox and Jews have been added to the population. Though smaller in number, Hindu, Sikh and Buddhist communities also exist within the city of Scottsdale. There is also a small population of members of The Church of Jesus Christ of Latter-day Saints (Mormons), as is common throughout Phoenix, Arizona, and the Western United States. The first church founded in Scottsdale was the First Baptist Church of Scottsdale, which was built by Scott and his family. The church has named a small non-profit coffee shop on the corner of their campus after Scott, called Winfield's. Congregation Beth Israel, the oldest Reform Judaism congregation in the Phoenix metropolitan area is located in Scottsdale, and is the largest congregation in Arizona. In North Scottsdale, there is the Jewish Community Center of Phoenix and the New Shul. The community center was originally located in central Phoenix, it had eventually outgrown the location and was looking to relocate and build a more expansive campus. In 2009, a new Armenian Apostolic church was built in the city, representing the larger numbers of Armenians in the Phoenix Metropolitan Area. The tourism industry is Scottsdale's primary employer, accounting for 39% of the city's workforce. In 2005, Scottsdale attracted over 7.5 million visitors to the city, providing an economic impact of over $3.1 billion. The city of Scottsdale by itself is home to more than 70 resorts and hotels, boasting over 15,000 hotel rooms. This large hospitality market primarily caters to a higher-end, white-collar demographic. The city of Scottsdale is tied with Atlanta for fourth, after New York City, Las Vegas, and Chicago respectively, as having the most AAA Five-Diamond hotels and resorts in the United States. In 2015, AAA bestowed four such properties in Scottsdale with the highest honor: The Phoenician, The Canyon Suites, Four Seasons Resort Scottsdale at Troon North, and the Fairmont Princess Resort and Spa. As of 2016, Scottsdale has the highest number of destination spas per capita of any city in the United States. The region's year-round warm weather and abundant sunshine is a major factor in Scottsdale's tourism appeal. In particular, during the winter, thousands of wealthy tourists from the midwest, the northeast, and as far away as Canada (known locally as "snowbirds"), flood the area with long-term visits. These tourists, who often practice the same migration routine annually, often end up purchasing second homes in the area. The Mayo Clinic has one of its three major branches in Scottsdale. This and its resulting effects have made Scottsdale an attractive destination for medical care. The aviation industry has also grown in Scottsdale, with the construction of Scottsdale Airport in , in the 1960s. Today, it is one the busiest single-runway airports in the United States in terms of aircraft operations. Though there is little to no commercial air service, nearly all operations are corporate or general aviation. The immediate area surrounding the Scottsdale Airport, known locally as the Airpark, has developed rapidly as a regional center of commerce. By 2004, the Airpark had grown to become the second-largest employment center in the Phoenix Metropolitan Area, with over 50,000 people being employed within a few-mile radius of the airport itself – notably in financial, retail, service, technological, design and manufacturing fields. The Airpark houses more nearly 2,500 individual businesses, with a combined economic impact of over $3 billion annually, and growing. The largest employment center in the Phoenix Metropolitan Area is the combined central areas of Midtown and Downtown Phoenix, with an estimated 65,000 employees. Among the companies headquartered in Scottsdale are APL, Cold Stone Creamery, Discount Tire, Discovery Land Company, Fender, Go Daddy, JDA Software, Kahala, Kona Grill, Magellan Health, Paradise Bakery & Café, P.F. Chang's China Bistro, Rural Metro, Axon, and United Blood Services. The city is home to corporate retail outlets, as well as independent boutiques. There are many shopping areas within the city of Scottsdale, ranging from small districts to large centers. The most notable regional centers include the Kierland Commons in North Scottsdale, and the Scottsdale Fashion Square in Downtown Scottsdale, a major destination for high-end retailers. These shopping centers (and others) in Scottsdale claim dozens of marquee brands that are unique to both Phoenix and the Southwestern region. As of 2016, the Scottsdale Fashion Square was ranked in the top 25 most visited malls in the country by Travel + Leisure magazine. It has consistently been one of the most profitable malls in the United States, being ranked in 2016 as the second highest sales per square foot mall in the country, The center is anchored by Nordstrom, Macy's, Neiman Marcus, and Dillard's. One Scottsdale, a collaboration between Macerich and DMB Associates, aims to be the next luxury retail center for the Phoenix-area. In a three-mile (5 km) radius, the center sees an average household income of $110,292, and its 10-mile (16 km) zone has more households earning over $100,000 than several famous retail destinations, including Bal Harbour, Naples, Aspen, and The Hamptons. Palmeraie, a 300,000-square-foot (28,000 m2), outdoor mixed-use project planned for the SWC of Indian Bend and Scottsdale Rds, has already received commitments from Hermès, Yves Saint Laurent, and John Varvatos. In 2005, the city's annual Scottsdale Arts Festival was ranked the number-one such event in the US by American Style Magazine. The highest concentrations of galleries, studios and museums that are open to the public can be found in Downtown Scottsdale. Its Scottsdale Arts District can be segmented into three distinct districts. 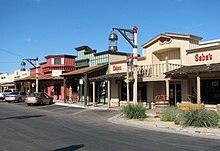 The largest is the Scottsdale Main Street Arts District, home to the largest and most diverse collection of styles and genres, the more contemporary Marshall Way Arts District, and the more touristy and western-themed Old Town district, which has the Scottsdale Museum of Contemporary Art. The very popular Scottsdale Artwalk is held weekly, every Thursday evening. Scottsdale's affluent culture has been depicted by shows such as MTV's My Super Sweet 16, which filmed an episode in the area in 2006, and by the short-lived CBS reality show Tuesday Night Book Club. "The West's most western town" prides itself in its rich Western history, preserving while heavily promoting its plethora of "western" activities and events. The Scottsdale Arabian Horse Show has taken place since 1955. Today, the show attracts thousands of visitors and tourists, to see nearly 2000 purebred Arabian and Half-Arabian horses competing for various prizes and recognition. The show also features over 300 vendors and exhibitions, and over 25 demonstrations and shows. Perhaps[weasel words] the most famous present-day "cowboy" event is the Scottsdale Jaycees Parada del Sol, an annual month-long event that has been held in Scottsdale since 1954. Originally named The Sunshine Festival, the PRCA Rodeo was added in 1956. Cowboys and cowgirls from across the nation converge in Scottsdale to participate in this cultural and historical event. The event begins each year with the Parada del Sol Parade, the world's largest horse-drawn parade with over 150 entries in any given year. Since 1971, Scottsdale has been home to the Barrett-Jackson Auto Show. Due to the success of this week-long event held every January, the organizers behind it have more recently inaugurated similar but smaller shows in Palm Beach, Florida and Las Vegas, Nevada. Now held at the expansive West World exhibition complex in North Scottsdale, the event is an auto enthusiast's and collector's spectacle. The show is known for featuring both exotic, luxury automobiles and historic vehicles which have been expertly restored to mint condition. Since 2007, Scottsdale has been hosting low and high fashion shows in the annual Scottsdale Fashion Week (not quite comparable to those of New York City), including popular department store line fashion designers and some higher end ones during the month of November. In what is considered to be the longest continually running festival of its kind in the nation, the Scottsdale Culinary Festival is held annually during April. Though many of its individual events are held citywide, they concentrate in the downtown area. Entirely, it is estimated that the week-long festival draws over 40,000 people. The most heavily attended such event is the festival's Great Arizona Picnic, an outdoor fair-like showcase of both well-known local and national chefs and restaurants. It is held on the lawn of the Scottsdale Civic Center Mall. The annual Scottsdale International Film Festival concentrates on the use of film to foster of the world's cultures, lifestyles, religions, and ethnicities. Scottsdale is home to more than 125 professional art galleries and studios, one of the highest per-capita anywhere in the nation. The city has quickly become a center for art in the United States. According to the Scottsdale Convention & Visitor's Bureau and American Style Magazine, the city has become one of the country's largest art markets, usually only sharing ranks with New York City, New York and Santa Fe, New Mexico in terms of commerce generated as a direct result of art sales and purchasing. Its galleries and studios are most famous for their western and Native American themed art, though a growing devotion to the contemporary arts has taken hold over the past couple of decades – an element most visible by the large number of modern art galleries which have opened along the Marshall Way Arts District, and the opening of the Scottsdale Museum of Contemporary Art (also referred to as SMoCA) in 1999. Both are located in Downtown Scottsdale. Located in the Old Town district of Downtown Scottsdale, the Scottsdale Civic Center Mall is home to the two-theater Scottsdale Center for the Performing Arts, the Scottsdale Historical Museum, as well as the Scottsdale Museum of Contemporary Art. SMoCA is the only permanent museum dedicated solely to the contemporary arts in the state of Arizona. Also located in Old Town, Western Spirit: Scottsdale's Museum of the West opened in January 2015, featuring historical and cultural exhibits from 19 states of the American West, including Arizona. Taliesin West, famed architect Frank Lloyd Wright's winter home and school from 1937 until 1959, is now one of the most popular tourist attractions in Arizona. The complex is located in the northeast fringe of the city, at the base of the McDowell Mountains. 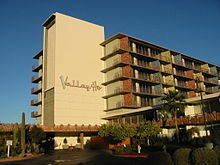 The Hotel Valley Ho caters to both day and night entertainment. Scottsdale is home to a variety of high-end nightclubs, restaurants, hotels, lounges and bars. This is evident by the growing number of style-conscious hotels that have opened up throughout Downtown Scottsdale which equally cater to the nightlife crowds. Most notably, the Morgan Hotel Group's all-white Mondrian Hotel (which went out of business), the FireSky Resort & Spa, the independent mid-century Hotel Valley Ho and the W Hotel. The majority of nightlife is concentrated in Downtown Scottsdale, between Camelback and Osborn roads. This is the most active and popular nightlife destination in the Phoenix Metropolitan Area. Similar to well-known nightclub districts in other major cities, much like Atlanta's Buckhead district and Miami's South Beach, most of Downtown Scottsdale's major bars and clubs are generally located within walking distance. Crowds of over 40,000-strong are known to congregate to this area. Southeast Scottsdale borders the Salt River Pima-Maricopa Indian Community. For several years, the Scottsdale Pavilions, a major outdoor shopping center, marked the only commercial property operating on tribal lands. In 1998, the tribe opened the first permanent casino in the Scottsdale area, Casino Arizona, at Loop 101 and McKellips Road. The success of Casino Arizona led to the construction of a second location, Casino Arizona at Indian Bend, in a temporary facility less than 8 miles (13 km) north. The passage of Proposition 202 in November 2002 redefined casino gaming in Arizona, permitting "Vegas-style" blackjack and poker, expanded number of slot machines and wider food and beverage service options. Both casinos underwent significant expansions following the passage of Proposition 202, with Casino Arizona at Indian Bend more than doubling in size. In 2010, the temporary tent facilities hosting the 120,000-square-foot (11,000 m2) Casino Arizona at Indian Bend were deconstructed following the opening of Casino Arizona at Talking Stick Resort. The 240,000-square-foot (22,000 m2) casino is adjoined to the newly constructed 15-story Talking Stick Resort & Spa, which features the Talking Stick golf course, a 36-hole golf course designed by Ben Crenshaw and . Today, the two casinos collectively have over 2,000 slot machines and 100 table games. There are numerous properties in the city of Scottsdale which are considered to be historical and have been included either in the National Register of Historic Places or the Scottsdale Historic Register. The gallery contains images of properties listed in the National Register of Historic Places with a short description of the same. Scottsdale Grammar School, also called The Little Red Schoolhouse, built in 1909. George Ellis House, built in 1925. Louise Lincoln Kerr House, built in 1925. Frank Tilus House, built in 1875. The Valley Field Riding and Polo Club of Scottsdale, built in 1924. Roald Amundsen Pullman Private Railroad Car. The city is the spring training home of the San Francisco Giants, who practice at Scottsdale Stadium in Downtown Scottsdale. Scottsdale Stadium also hosts the Scottsdale Scorpions, a minor league baseball team in the Arizona Fall League. In February 2011 the Colorado Rockies and Arizona Diamondbacks began sharing a new spring training facility, Salt River Fields at Talking Stick, located on the city's eastern border with the Salt River Pima-Maricopa Indian Community. Though none play specifically in the city of Scottsdale, all of the "Big Four" North American major league sports organizations have franchises and play within the Phoenix Metropolitan Area – NBA's Phoenix Suns, NFL's Arizona Cardinals, MLB's Arizona Diamondbacks and NHL's Arizona Coyotes, as well as a WNBA franchise, the Phoenix Mercury. Phoenix Rising FC, a member of the United Soccer League, play their home matches at Phoenix Rising FC Soccer Complex, a temporary stadium near Loop 101 and Loop 202. Since 2010, the historic WM Waste Management Phoenix Open Golf Tournament – formerly the FBR Open and Phoenix Open, which originally began in 1932 – is now held annually each January at the Tournament Players Club (or "TPC") in North Scottsdale. The TPC is adjacent to the large Fairmont Scottsdale Resort. It is the largest-attended stop of the annual PGA Tour, attracting well over 500,000 people to the 4-day event alone. Hiking, rock climbing and other similar outdoor activities are enormously popular throughout the Phoenix-area, in large part to the immediate accessibility of mountain areas within or very near the city limits. Citizens flock ritually to local favorite Camelback Mountain, located in the eastern section of Phoenix, just adjacent to Scottsdale, as well as the McDowell Mountains in the McDowell Sonoran Preserve, at the city's northeastern fringes. On January 19, 2013, the Talking Stick Resort hosted King of the Cage's televised mixed martial arts event, Regulators. The show, now owned by the Ultimate Fighting Championship, featured future UFC talent like Cody East, Jordan Johnson and flyweight championship contender Ray Borg. Scottdale is continually ranked as one of the premier golf and resort destinations in the world, with a sizable portion of tax revenue being derived from tourism. It is also home to the Phoenix Open Golf Tournament held at the Tournament Players Club every year and the Barrett-Jackson car show held at WestWorld. In all, the city is home to more than 200 area courses offering layouts that range from the rolling green fairways of traditional courses, to desert golf designs. In 2006, the Robb Report cited Scottsdale as, "America's Best Place to Live for Golf." The Boulders Resort & Golden Spa and Four Seasons Resort Scottsdale at Troon North were selected in 2005 as the second and fourth best golf resorts in the nation by Travel + Leisure Golf magazine. 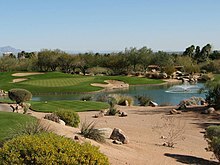 Other golf courses in the area include FireRock, Troon North, The Phoenician, and Silverleaf, and Desert Mountain. Scottsdale National Golf Club is a private golf club in the McDowell Mountain Range, the course itself is a par 72 on 290 acres (1.2 km2). In the past, it has received awards from Golf Digest and Golfweek. It hosts an 18-hole course as well as a nine-hole course called "The Bad Little Nine." The club also hosts the "Wild West Invitational," a tournament including a final round where competitors must contend with loud distractions. It has also been mentioned as a possible location for future PGA Championships. Scottsdale is governed by a mayor and city council, all of whom are elected "at large" to represent the entire city. A city manager is responsible for the executive leadership of the city staff, as well as implementing council policies, developing programs and budgets to respond to council goals, and ensuring that citizens receive effective and efficient city services. The city manager also serves as the city treasurer. The current mayor is Republican Jim Lane. The distinctive Scottsdale City Hall was designed by architect Bennie Gonzales in 1968, and was designed with an interior kiva for community meetings. Public education in Scottsdale is provided for by both the Scottsdale Unified School District (SUSD), which serves most of Scottsdale, most of the town of Paradise Valley, as well as parts of Tempe and east Phoenix, and the Paradise Valley Unified School District (PVUSD), which serves northeast Phoenix and North Scottsdale. SUSD serves 25,668 students in 33 schools and employs 3,862, including 1,551 teachers. SUSD's 33 schools include five high schools: Arcadia High School, Coronado High School, Chaparral High School, Desert Mountain High School, and Saguaro High School. PVUSD is the 7th largest school district in the state, with approximately 30,000 students and 3,800 employees. It contains 47 schools, including 7 high schools. The high schools which serve portions of Scottsdale are Horizon High School and Pinnacle High School. The primary institution of higher education in the city is Scottsdale Community College, which opened in 1970 on the Salt River Pima Maricopa Indian Reservation. In 1999, the school opened a second campus in the Scottsdale Airpark allowing it to serve the business community and north Scottsdale. Other institutions of higher education with locations in Scottsdale include the Mayo Clinic School of Medicine, University of Phoenix, Gateway Seminary, and the Scottsdale Culinary Institute. Many students at nearby Arizona State University in Tempe live in Scottsdale and commute. Scottsdale has a main branch and four branches within the Scottsdale Public Library System. State Route 101 – locally known as Loop 101 – provides convenient Metropolitan Phoenix Freeways access. The city is home to Scottsdale Municipal Airport (IATA: SCF, ICAO: KSDL), a single-runway airport located in North Scottsdale. While the airport serves some tour and commuter flights, the plurality of aircraft operations are corporate and transient general aviation traffic. Commercial air travel is served by Phoenix Sky Harbor International Airport (IATA: PHX, ICAO: KPHX) in Phoenix and Phoenix Mesa Gateway Airport (IATA: AZA, ICAO: KIWA) in Mesa. Public bus service for Scottsdale and the Phoenix Metropolitan Area is provided by Valley Metro. The city of Scottsdale runs a network of local neighborhood circulators, labeled the "Scottsdale Trolley." Using trolley-replica buses, the public service is free to riders. There are currently two circulating "routes," known individually as the Downtown Trolley and the Neighborhood Trolley. These connect at the Loloma Station transit center in downtown Scottsdale. 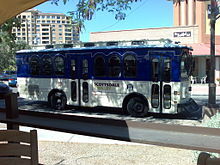 The Downtown Trolley circulates through downtown Scottsdale, and the Neighborhood Trolley circulates from downtown Scottsdale to neighborhoods throughout South Scottsdale, connecting with the city of Tempe's own free public circulator, the Tempe Orbit at Roosevelt and Scottsdale Road. From there, riders can transfer onto the Tempe Orbit, and travel to Tempe, including Arizona State University's main campus, and the downtown Tempe, or Mill Avenue, area. Between December 2007 and 2009, Scottsdale was a member of the board of Valley Metro Rail line which connects the neighboring cities of Phoenix, Tempe and Mesa. There was a study in 2001, and some discussion since, of extending the light rail line into Scottsdale. The city's Transportation Master Plan identifies Scottsdale Road as the city's high-capacity corridor, which could be light rail, modern streetcar service, or bus rapid-transit (BRT). A street railway interurban line was proposed to connect Scottsdale with Phoenix, Tempe, and Mesa as early as 1913 but was never built; Scottsdale is the largest American city that has never had a rail line. ^ "United States Census Bureau". United States Census Bureau. December 2014. Retrieved January 11, 2015. ^ "The 31 Places to Go This Summer". The New York Times. May 31, 2008. Retrieved May 23, 2010. ^ a b "Scottsdale Overview, p. 10" (PDF). ^ a b "Hohokam Culture". Encyclopædia Britannica. ^ "The Best of Scottsdale". ^ a b c d e f g h i j k l m "The West's Most Western Town". Scottsdaleaz.gov. ^ a b c d e "History of Scottsdale". Scottsdale Convention & Visitor's Bureau. ^ a b "About Scottsdale". InSider Scottsdale. ^ "Scottsdale's History in Pictures". Scottsdale Public Library. ^ Phoenix City Directory. Arizona Directory Company. 1912. p. 3. ^ "Scottsdale's History in Images". Scottsdale Public Library. ^ "Scottsdale Historic Register" (PDF). Scottsdaleaz.gov. ^ "Electric Railway Journal articles archived by the Phoenix Trolley Museum". Retrieved July 11, 2011. ^ "History of Cotton in Arizona: A Timeline" (PDF). Jandatri.com. Archived from the original (PDF) on January 27, 2015. Retrieved January 27, 2015. ^ "Jokake Inn History". The Phoenician Inn. ^ "Taliesin Historical Legacy". Taliesin. ^ "The Frank Lloyd Wright Spire". Live Better in Scottsdale. ^ "Scottsdale Airport History". Scottsdaleaz.gov. ^ "Papago Park POW Camp". ^ Myers, Patricia Seitters. "Scottsdale: Jewel in the Desert". ^ a b "Indian Bend Wash Book" (PDF). Scottsdaleaz.gov. ^ a b "Key Events in the History of Scottsdale". Scottsdale Museum. ^ a b "The Story Behind Scottsdale's McCormick Ranch". Arizona Oddities. ^ "History of McCormick Ranch". McCormick-Stillman Railroad Park. ^ "McDowell Mountain Ranch History". ^ a b "DC Ranch History". ^ "What Trail Led Us Here". McDowell Sonoran Conservancy. ^ "Scottsdale History." Scottsdale Convention & Visitors Bureau. Retrieved on June 1, 2006. ^ "U.S. Census Bureau QuickFacts: Scottsdale city, Arizona". www.census.gov. Retrieved January 2, 2019. ^ a b c "Indian Bend Wash: Construction Complete." United States Environmental Protection Agency. Page last updated on February 16, 2007. Retrieved on February 28, 2007. ^ Butler, Jay; Lambrakis, Christine. "Greater Phoenix August Resale Market Housing Price Increases Slow." Arizona State University. September 14, 2005. Retrieved on August 9, 2006. ^ "SkySong: Project Overview." skysongcenter.com. February 2007. Retrieved on April 29, 2007. ^ "Largest Shopping Malls in the United States (2004)." American Studies, Eastern Connecticut State University. December 17, 2005. Retrieved on August 9, 2006. ^ Christie, Les. "Real estate cools down." CNN (CNN Money). May 16, 2006. Retrieved on July 6, 2006. ^ "Ritz-Carlton to build $400 million Scottsdale resort-residential complex". USA Today. June 22, 2006. Retrieved September 1, 2008. ^ Balazs, Diana (July 15, 2008). "Ritz-Carlton developer won't appeal ruling". The Arizona Republic. Retrieved September 1, 2008. ^ "Scottsdale Weather: Records & Averages." Yahoo! Retrieved on April 30, 2007. ^ "Average Weather for Scottsdale, AZ – Temperature and Precipitation". Weather.com. Retrieved April 20, 2008. ^ History of CBI, Synagogue website, Our Community. Accessed December 4, 2008. ^ Ettenborough, Kelly. Arizona's Sanctuaries, Retreats, and Sacred Places, Big Earth Publishing, 2003, 9781565794382, p. 25. ^ "Headline News." Downtown Scottsdale Bulletin. November 7, 2006. Retrieved on April 18, 2007. ^ "AAA/CAA Five Diamond Hotels – January 16, 2015" (PDF). AAA. January 16, 2015. Retrieved February 27, 2015. ^ Roxborough, Shannon. "Tourists often wind up buying second homes." northjersey.com. April 15, 2007. Retrieved on April 18, 2007. ^ "Mayo Clinic Scottsdale (website)." Retrieved on April 29, 2007. ^ "." Retrieved on February 23, 2017. ^ Totten, Steven (August 7, 2016). "Scottsdale Fashion Square maintains its shopping stronghold with new retailers". Phoenix Business Journal. Archived from the original on December 18, 2016. Retrieved December 18, 2016. ^ "Two More Apple Stores To Open In Arizona And Washington D.C." The Apple Pips. December 14, 2016. Archived from the original on December 18, 2016. Retrieved December 18, 2016. ^ "Scottsdale Fashion Square". About Travel. August 31, 2016. Archived from the original on December 18, 2016. Retrieved December 18, 2016. ^ Sharon Edelson (September 23, 2008). "Palmeraie Heats Up Luxe Retail Competition in Arizona". Penske Media Corporation. Retrieved October 9, 2017. Subscription required. ^ "Save the date ... for a really long time". October 26, 2008. ^ Scharnberg, Kirsten. "A new sin city: 'Snottsdale'." Chicago Tribune. July 4, 2006. Retrieved on July 6, 2006. ^ Rose, Jaimee. "Welcome to Marissa's world." Arizona Republic. April 26, 2006. Retrieved on July 6, 2006. ^ cpcomapreable, Judy. "Scottsdale Arabian Horse Show." About.com. Retrieved on August 9, 2006. ^ "Scottsdale Jaycees Parada del Sol – History." Scottsdale Jaycees. Retrieved on August 16, 2006. ^ "Listings of Scottsdale Art Galleries." Scottsdale Convention & Visitors Bureau. Retrieved on July 6, 2006. ^ Staff Writer. "Things to do in Phoenix." The Arizona Republic. June 7, 2006. Retrieved on December 7, 2006. ^ "Scottsdale's Museum of the West". Scottsdale's Museum of the West. February 17, 2015. Retrieved February 17, 2015. ^ Clark, Jayne (December 20, 2007). "Old West meets New West in Scottsdale, Ariz". USA Today. Retrieved May 23, 2010. ^ "Scottsdale Stadium." City of Scottsdale (website). Retrieved on April 18, 2007. ^ "Best Golf States". Golf Digest. ^ "Top 10 Golf Destinations". Golf Travel. ^ "Top 10 Golf Destinations In The World". Top Golf. ^ "Top 10 US Golf Destinations". Accuweather. ^ "Top 10 Golf Destinations". World Travelers. ^ "Top 10 Golf Locations". Travels Madness. ^ Bennett, Liam. "Scottsdale's Fantasy 18." Scottsdale Convention & Visitors Bureau. Retrieved on June 1, 2006. ^ Staff Writer. "2005 World's Best Golf Resorts." Travel + Leisure Golf. Retrieved on July 6, 2006. ^ "Scottsdale National Golf Club, Scottsdale, AZ". GolfLink. Retrieved December 19, 2017. ^ Matuszewski, Erik. "The Baddest Nine Holes In Golf Has PXG Ties And A $1,000 Offer To Break Par". Forbes. Retrieved December 19, 2017. ^ Matuszewski, Erik. "Has Billionaire Bob Parsons Created Golf's Wildest Member-Guest Tournament?". Forbes. Retrieved December 19, 2017. ^ Hennessey, Stephen. "PGA Championship 2017: 11 venues that could now host a major in May - Golf Digest". Golf Digest. Retrieved December 19, 2017. ^ Scarp, Mark (December 4, 2008). "Gonzales left his creative imprint on Scottsdale". East Valley Tribune. Retrieved January 4, 2009. ^ a b "Scottsdale Unified School District: About Us". Scottsdale Unified School District. Retrieved January 24, 2014. ^ "Paradise Valley Unified School District Description". Paradise Valley Schools. ^ "Paradise Valley Unified School District Schools". Paradise Valley Schools. ^ Fudala, Joan (2001). Historic Scottsdale: A Life from the Land. Singapore: Historical Publishing Network. p. 77. ISBN 1-893619-12-5. ^ Powell, Brian (December 13, 2007). "City opts for seat at Valley light-rail planning table". East Valley Tribune. Archived from the original on July 27, 2009. Retrieved February 1, 2009. ^ "Interurban Line Proposed". Phoenix Gazette. June 20, 1913. ^ Schwieterman, Joseph P. (2004). When the Railroad Leaves Town: American Communities in the Age of Rail Line Abandonment, Western United States. Kirksville, Missouri: Truman State University Press. p. xxiv. ISBN 978-1-931112-13-0. ^ "Interactive City Directory: Scottsdale, Arizona". Sister Cities International, Inc. Retrieved March 28, 2013.